If Epic Yarn was like pants, Return to Dream Land is like a warm sweater of love and nostalgia. It's kind of funny how things seem to work out for Kirby. In the Nintendo 64 era, Kirby Air Ride was announced as a near launch title for the system, but instead made an appearance on the GameCube. Now. 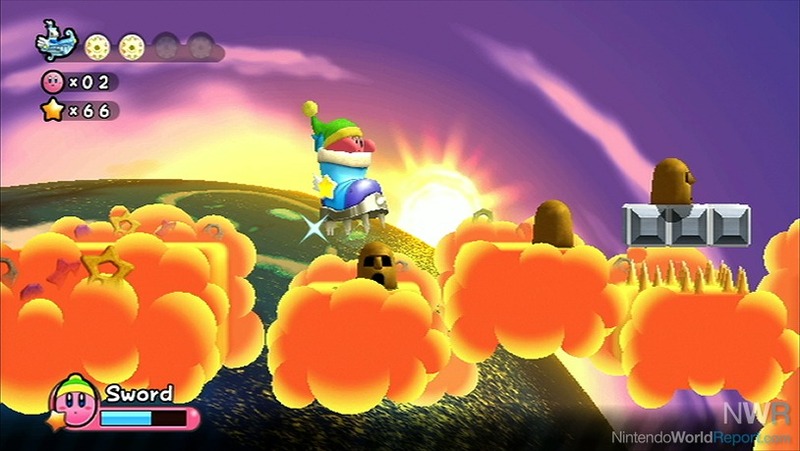 the Wii receives the proposed GameCube Kirby title, Kirby's Return to Dream Land, the first Kirby platforming console game since the N64's Crystal Shards. It's been a long time, but Return to Dream Land is a fine game that will inspire even the most casual of Kirby fans to welcome back the beloved pink puff. The story behind Return to Dream Land is that a space traveler named Magolor has crash landed onto planet Pop Star and lost five crucial pieces of his ship, the Lor Starcutter, alongside 120 energy spheres. He recruits the help of Kirby, King Dedede, Waddle Dee and Meta Knight in order to fix his ship and help him return home. The story is very basic, but save for a few titles here and there, Kirby was never known for its lavish plot and character development. There are a couple of twists near the end, though, so even with its light story, Return to Dream Land does have its surprises. Last year's Epic Yarn was, in technicality, a Kirby game due to Kirby starring as a playable character, but Return to Dream Land is a true Kirby game in terms of gameplay design. The title actually plays like Kirby's Adventure for the NES and Kirby Super Star for the SNES. There are five worlds initially, with a couple more unlocked once players beat the first set of challenges. 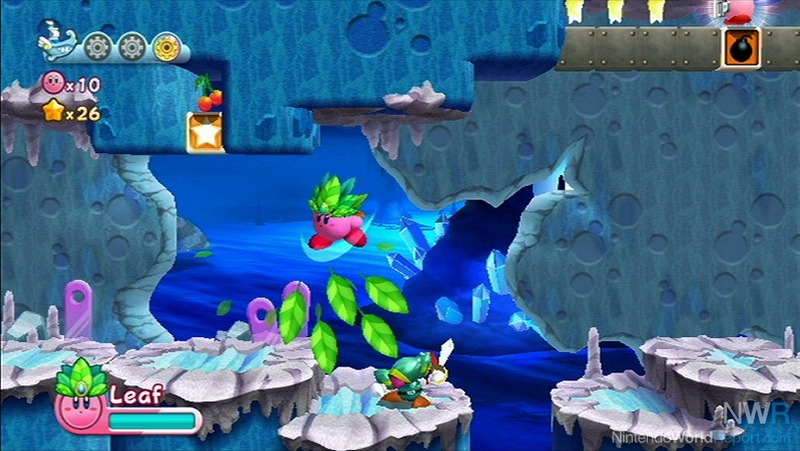 These are accessed through a world map similar to the overworld in Kirby's Adventure. It's nothing too fancy, but gets the job done. allowing players to easily access the levels contained within each world. As for the actual gameplay, this is a pure Kirby game. Return to Dream Land does have some new concepts here and there, but the overall feel of the game is classic and very nostalgic. For starters, Kirby's inhaling ability has been retained. When swallowing a specific enemy, Kirby wields the enemy's power and gets to use it against the other enemies. There are many creative powers to absorb and unleash onto enemies and bosses, such as the classic Beam, Tornado, and Fire. Some new attacks have been added as well, such as Whip where he dons cowboy garb and uses a whip to attack enemies. This has always been one of my favorite aspects of the Kirby series, and it is great to see it retained in Return to Dream Land. Speaking of new ideas, Return to Dream Land introduces multiplayer for up to four players, similar to New Super Mario Bros. Wii. The feature itself has been very well integrated into the core elements of gameplay. Players can drop in and out very easily and without the need to halt the gameplay. 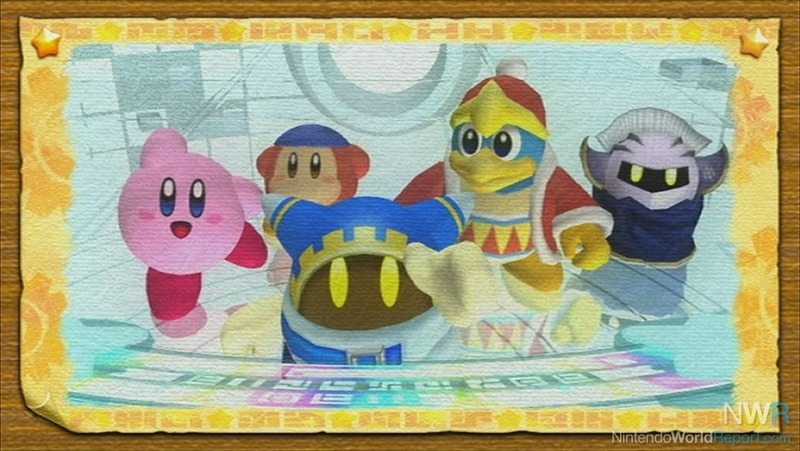 Best of all, if a player happens to stay behind, he will automatically appear right next to the Kirby player. This prevents many of the headaches some players experienced in New Super Mario Bros. Wii, such as gameplay slowing down just so all players could catch up. A character can also ride on the back of another character and heal themselves if they are low on health. There is, however, one catch. If the Kirby player dies, the game ends. If the other characters die, they just respawn, but the Kirby character ends the game if he dies. Also, adding other players costs Kirby a life. Each of the other character has their own unique set of skills. 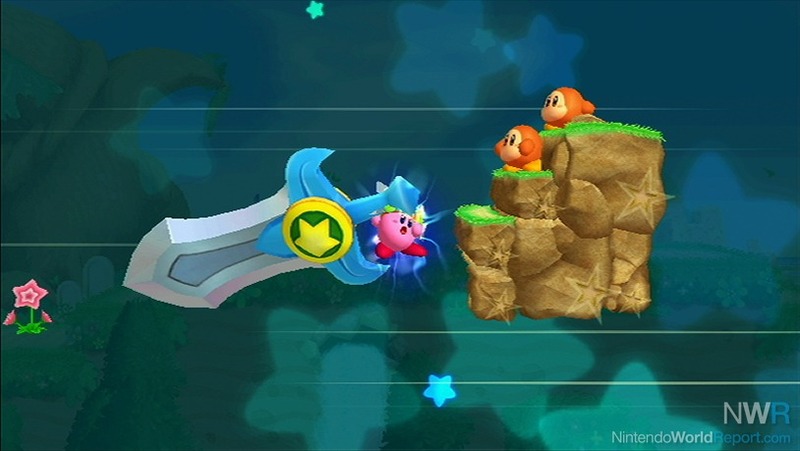 Meta Knight can fly and perform a variety of sword attacks for strong melee combat, King Dedede can use his hammer and Waddle Dee uses a spear (which plays similarly to Kirby's own spear ability). 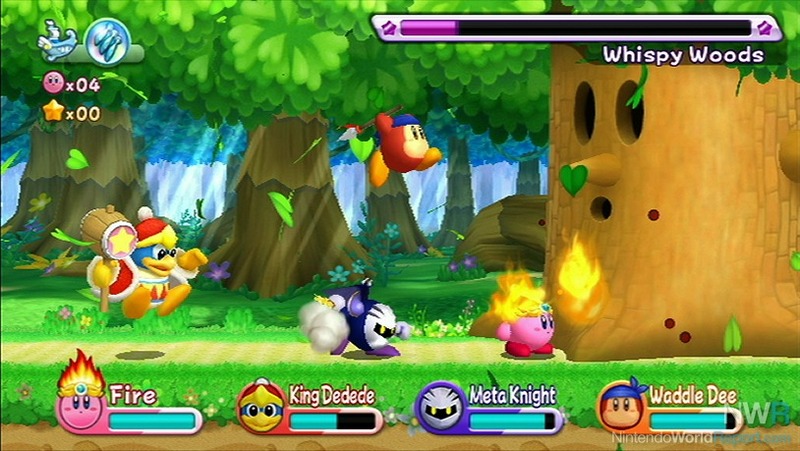 In addition, players can just play as a different colored Kirby. In comparison to New Super Mario Bros. Wii, it is much easier to navigate with other players on-screen. There is no need to complete the whole game in multiplayer mode as the levels have been designed to be completed regardless if you are playing solo or with other players. It will give you an advantage over tough bosses, however, and it is a fun way to spend an evening with friends. Another new idea is the Super Abilities. At certain points, Kirby encounters a powerful enemy whose attacks are similar to the standard Kirby power ups, but are actually grander in scope and power. As an example, Kirby summons a giant hammer that destroys oversized stakes, and in another case, Kirby summons a magical orb to activate specific switches. The game is controlled with the Wii Remote on its side, controlling similarly to past Kirby games on NES and SNES. It all works wonderfully thanks to the streamlined design of Return to Dream Land. Even when the game features motion controls, it is restrained to limited, specific uses and power ups rather than being a major component of the game like it was with last year's Donkey Kong Country Returns. In terms of replay value, Return to Dream Land doesn't offer a plethora of bonus modes, but what it does offer will have players returning to it for a long time. Each world offers up to five stages (though some levels only offer four) and a boss battle. These worlds have energy spheres hidden within, 120 in total. These are reminiscent of the golden coins in the New Super Mario Bros. games. Collecting these unlock new challenge levels that reside in the ship, as well as ability rooms where players can come in and try out each ability. Needless to say, completionists will be playing the game for a while, as many of the spheres have been cleverly hidden and require a special ability to collect them. It wouldn't be a Kirby game without mini-games, and Return to Dream Land isn't an exception to the norm. Two mini-games can be unlocked as you collect energy spheres. The first of these is Ninja Dojo, a target game where players throw ninja stars at the targets on screen. The second is a shooting game where players defeat robots by completely destroying them. A third, secret mode can be unlocked once players finish the game. These prove to be a fun diversion, though they only offer three levels per mini-game. Regarding difficulty, those expecting this game to be just as easy as Epic Yarn can lay their fears to rest. One of the best things about Return to Dream Land is how the difficulty gradually escalates as more and more levels are completed, especially near the end when things get really tricky and challenging thanks to clever enemy placement and obstacles to avoid. The overall package hardly presents any real flaws, just minor nitpicks. For example, in single-player mode, you can't play as any of the other characters. They are only available through multiplayer mode. Some players might also feel that the game isn't innovative enough, especially after years of receiving Kirby games with more interesting game design. But like I mentioned, these are all minor and can be overlooked thanks to how well polished the overall game is, right down to the graphics and sound. Speaking of which, the graphics in Return to Dream Land are very beautiful. They are not quite as quirky and experimental as last year's Epic Yarn, but the presentation features great use of color, fantastic textures, and wonderful character design. The Super Abilities fill the screen with many colors and special effects, giving the game a dazzling aesthetic. The music is quite good as well thanks to some remixes of classic Kirby songs, but it isn't as memorable as in past Kirby games. Kirby's Return to Dream Land is a very fun, classic game that delights in its streamlined, simple appeal. The gameplay avoids most of the conventions associated with modern day platformers, especially Wii platformers, but the new additions and ideas are placed tastefully without getting in the way of the classic feel of the franchise. There are plenty of things to do in the game, and the difficulty actually rewards skilled players for their tenacity. This is one return you will want to experience before the year runs out. Good to read that the game is a great iteration of Kirby with multiplayer and cool powers. There's so many games this year's end that I want to get that I wonder if I can find time and money for Kirby's Return to Dream Land. I hope I do. I burned through this game before sending it Pedro for the review. I was pretty blah about it, and I usually love Kirby games. It's not bad; it's just Kirby. I mean, it's fun. I just feel like I've played it a million times before. I prefer the Epic Yarn/Mass Attack Kirby future. Def gonna get it but I still want another Kirby game that plays like Amazing Mirror. Kirbtroid FTW! That's why I said that the game might not be new enough to anyone that played Epic Yarn, Mass Attack and the previous games that were concept heavy. This is the first Kirby game I played in years as I had avoided nearly all the games in the franchise, so for me this was great. At this level of indecision I'll probably end up not getting either game. It's the first brand new traditional Kirby made by HAL in over 10 years. Amazing Mirror and Squeak Squad were both outsourced to Flagship and it showed. Returned to Dream Land actually brings the series back to the quality that HAL was famous for. So yes, this game is indeed a must own to all Kirby fans for actually being top tier at the traditional style of Kirby gameplay. Right. Even the most traditional Kirby games on the GBA were experimental and different takes on the formula. Save for the additions I mentioned, this is a pure, classic Kirby game. I thought it was great as it reminded me greatly of Kirby's Adventure and Super Star.